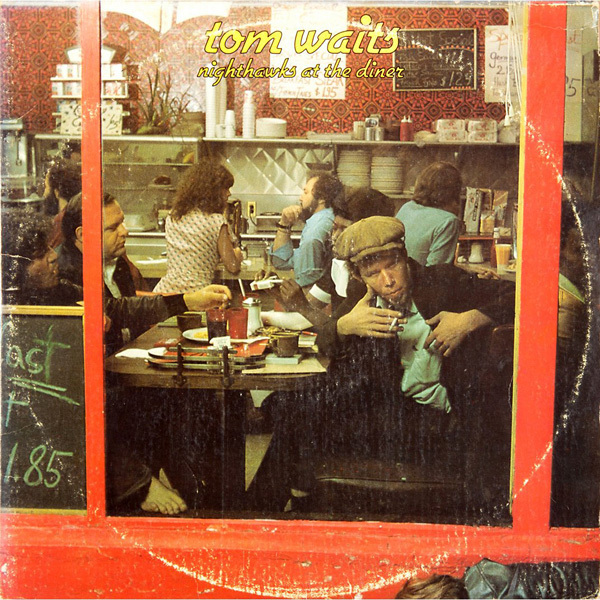 Adding this one to the Vinyl Christmas list… I randomly came across Tom Waits Nighthawks at the Diner on my iTunes, forgetting that I imported a ton of Tom Waits from my Uncle last time he was over but never really listened to it all. Recorded in 1975 in front of a small invited audience, the album is often referred to as “poetry recitations with a jazz backing“. Waits takes the audience on a tour through the midnight bars of L.A, regaling them with tales of lost love, late night rendezvous and drunken exploits. His rhetoric with the crowd is hilarious and the album really makes you feel as if your right there in a dimly lit, smokey bar somewhere watching him perform at 2 a.m.
With nothing but a piano, sax, bass and drums, this is a perfect album for a late-night evening. Highlights of the album are without a doubt Emotional Weather Report, Nighthawk Postcards, Eggs and Sausage, and Better Off Without a Wife.